Artistic Stamped Concrete of Maryland Inc. provides top paving stone art as well as stamped concrete. For those that prever to have the “cobblestone” feel or would like to use paving stones to create walkways, steps, and access points where concrete can’t be poured we’re happy to turn your property into art. Feel free to have a look at some of the art from our projects in the gallery below or Call Us For A Consultation. Artistic Stamped Concrete of Maryland provides uncontested decorative concrete design. Whether you’d like to imprint your Maryland pride in the backyard walk, or the Baltimore Ravens emblem in the retaining walls of your garden, our design team is as artistic as they are professional (Hence the name). If you can dream it, we can pour it. 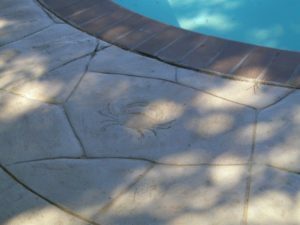 Browse through our decorative concrete page to browse some of the designs we offer, or feel free to fill out the quote request form on our contact page, and attach an image with your submission.